Electrostatic Painting and Metal Refinishing « PROTEK Onsite. Overnight. Using special paint that has been OSHA and EPA approved for indoor use, Electrostatic Painting (aka electrostatic refinishing) is a state-of-the-art process for painting any metal surface. By placing a high voltage electric charge on each atomized particle of paint, and grounding the metal surfaces to be painted, the paint has no place to go but to the grounded surfaces. This unique method sprays an environmentally compliant, low VOC coating onto an existing metal surface with no overspray, so the work can be performed virtually anywhere without undesirable affects, including office environments. 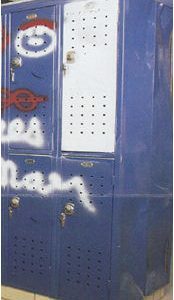 The resulting finish looks and performs as if it were new, without the typical splatter or drips caused by traditional painting. 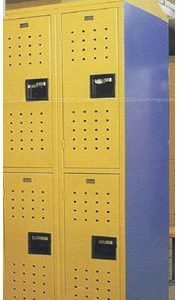 Lockers in Schools, Clubs, etc. Equipment in Hospitals, Laboratories, Country Clubs, etc. Protek will match any color, or custom make a special color.